When I was a 17 years-old-year Senior in High School, I was in several Advanced Placement courses. As the school year drew to a close, I wanted to take the AP test that would allow me to attain college credit. The AP tests, however, were very, very expensive. I went to my guidance counselor. She said that they could waive the fees for the exams if I qualified for the school’s free lunch program. I had avoided the free lunch program for years. I had been on the free lunch program in elementary school and middle school but was always embarrassed by it. So when I got to high school, I didn’t apply for it. I picked up a part time job so I could pay for my own lunch. But now, I wouldn’t be able to take my AP exams if I didn’t fill out the free lunch program form. So I agreed to fill out the form. Later that day, my guidance counselor sent a student aide with the form to my social studies class room, where in front of the entire class, she declared that I needed to fill out the free lunch form. I remember the shame of not only my classmates laughing at me that day, but my high school teacher bursting out in laughter as well. My family was poor. My father abandoned our family when I was in elementary school, leaving my mom to raise four children by herself. I don’t know of many people that worked harder than my mom. She worked two jobs for many years to keep our family together. She worked in an inner city Baltimore sub shop (the kind of store with the thick plexi-glass barrier and the small turnstile to exchange money and food). After her ten-hour day shift, she would head over to the inner city nursing home to work the graveyard shift as a nurses’ aide. She would return home at seven in the morning to make us breakfast, grab a quick nap, before heading back to work at 10am. She worked nearly 20 hours a day, six days a week. She insisted on keeping the Sabbath holy and would reserve all day Sunday for service at our church. A devout Christian woman with an incredible work ethic. Despite her long hours of work, she had trouble making ends meet. Our family lived in a small two bedroom apartment in a rough inner city Baltimore neighborhood. For long periods of time, there would be nothing to eat in our refrigerator. I tell my 11 year-old daughter who is coming dangerously close to being as tall as I am, that if I had had proper nutrition when I was her age, she would never be close to me in height. So back in the 1980’s, my mom applied for food stamps. We used them to buy groceries and food. We needed this safety net to eat, to survive. Years later, I remember sitting in an evangelical seminary classroom as a student in a Christian ethics class. The topic was government programs that helped the poor. I sat listening to the vitriolic venom spewed by these good Christian men about freeloaders and welfare queens. I sat in stunned silence listening to future pastors judging people they did not know — sitting in their seminary ivory tower casting dispersion on all these freeloaders. A few weeks ago, North Park University (where I am now privileged to serve as a member of the faculty) sponsored a viewing of The Line, a short feature documentary produced by Sojourners. The film showed images of everyday poverty throughout American (apparently a topic that is taboo in Presidential politics). Seeing the courage of these individuals sharing their struggles emboldened me to share my story. So this tenured professor who holds four advanced degrees from two Ivy League institutions with a fifth advanced degree on the way, shared with a group of undergraduates that he had once been on food stamps. That I wouldn’t have made it through my education without government help – through food stamps, free lunches, Pell grants, and government-backed student loans. So maybe my story makes me a part of the 47% that has grown dependent on government and would never vote for a self-made man. Maybe some will view me as the offspring of a welfare queen. Or maybe I fulfill a new political category tinged with racial overtones: the food stamp professor. Or maybe my story makes me an American. 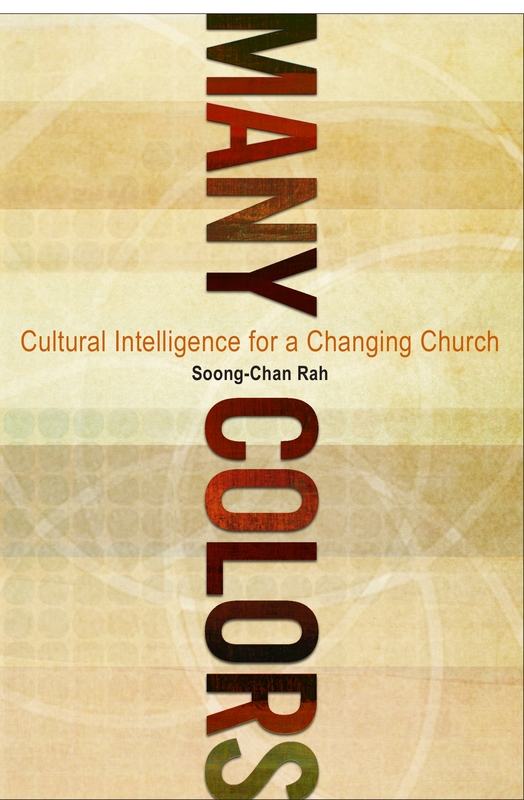 Following a short overview of the book by Dr. Rah, a dialogue with church leaders who engage in multicultural competency in their ministries will take place, exploring various approaches. The discussion will cover tips for success and well as lessons they have learned along the way. Professor Rah will be available following the dialogue for a book signing. The Gleacher Center is located on the north side of the Chicago River 1 block east of the Sheraton Hotel (site of the CCDA Conference), the second building west of Michigan Avenue. Enter on the east side of the building. Room 600 is on the 6th floor. Fresh fruit will be served. Due to limited space, you must RSVP for this event. If you are interested, contact me to get your name on the guest list. Speaking at Gordon-Conwell Theological Seminary’s National Preaching Conference (along with Haddon Robinson, Tony Evans, and Alistair Begg). They really need to have a woman preacher at the next one. See LINK at the Gordon-Conwell web page. Available online. I guest edited the Common Ground Journal. This issues’ topic: Multicultural education at theological schools. Interesting articles by Mark Harden (Bethel Seminary), Lisa Anderson Umana, Soong-Chan Rah (North Park Theological Seminary), David Leong (Seattle Pacific University) and Liz VerHage (North Park University). Please take the time this weekend to reflect upon the mystery of the Cross. That God, Himself, would die for such as us. The great lengths that Christ went to demonstrate his covenant loyalty and faithfulness towards us. And rejoice that the cross is not the end of the story. That he is risen! He is risen indeed! “St. Elsewhere” and “Cheers” — The medical drama has finally come to an end. Finally, health care reform. Let’s look at the word “reform.” In essence, it is an attempt to fix what is broken. The health care system was working for some and not working for others. All this unnecessary drama over something that was broken and needed fixing. Let’s have some civility here and stop the name calling. This is not socialism, Marxism, or Fascism, or whatever -ism is your favorite hate-filled word. The best of what government can do is to look out for the well being of all people, not just the privileged few. It won’t always get it right, but I like to see the government at least try. Next: Comprehensive Immigration REFORM. 4days4justice: April 14-April 17 on the North Park University campus. A smorgasbord of activities that will challenge Christians to examine the topic of Biblical Social Justice. Despite what Glenn Beck says, Social Justice is not a code word for communism (again with the -isms). Meet and interact with Christians from a wide spectrum of experiences and perspectives who are seeking a Biblical Social Justice. Some great speakers and participants will be in attendance, including Carl Ellis, Noel Castellanos, Peter Cha, Richard Twiss, Jonathan Merritt, among many others. See the previous blog entry for more information. Reload-Chicago (also at North Park University). Co-sponsored with the Urban Youth Workers Institute. See the website for more details. Micah 6:8 Conference (Coming this summer) – Stay tuned for more information. Efrem Smith and I are teaching a course in the Fuller Doctorate of Ministry program this summer (June 21-25) called Building Multi-Ethnic Congregations. If you are in the SoCal area, check it out. You do not have to be a DMin Student to take the course. You can take the course as a visiting student for a greatly reduced fee: Check out the Fuller link. And finally, our family (“married with children”) is taking a “quantum leap” Next year, I’m on sabbatical and will be returning to school. I’ll be in a ThD program at Duke for the duration of the next academic year. Moving to Durham for a year. Let me know if anyone is interested in renting a furnished house in Chicago for a year or if anyone has any leads on housing near Duke next year. Father’s Day has always been a bittersweet holiday for me. For most of my life, my father was absent, having abandoned our family when I was in elementary school. Father’s Day as a child was a painful reminder of what was missing in my life. But now, as a father of two wonderful elementary school-aged children, I enjoy the sweetness of Father’s Day. I enjoy the hushed voices of my kids trying to hide their Father’s Day present from me. I enjoy the sweetness of knowing that I’m not missing out on the best years of my kids’ lives. But I must admit that in my most vulnerable moments, I allow my earthly fears and anxieties get the best of me and I wonder, given my history, am I going to be a good enough father? One of my favorite passages in scripture is Matthew 1. I love the genealogy of Jesus because it reminds me that the Messiah himself comes from what could be considered an embarrassing lineage — questionable parentage with a history of violence, infidelity, and just downright sinfulness. Yet, at the end of this embarrassing lineage is my Savior, who in his birth, life, death, and resurrection is able to transform shame, guilt, and embarrassment into honor, forgiveness, and joy. Father’s Day reminds me that my Heavenly Father is a source of grace, faithfulness, and covenant loyalty. And that I’m also called as his son to be a source of grace and faithfulness. My father passed away more than six years ago. He suffered a stroke and lingered in a hospice for about a month. He was unable to talk during his last month of life, but during the last days of his life there was genuine reconciliation and restoration between my father and me. Extending forgiveness to an absentee father allows me to enter into my own role as a father with greater freedom and grace. Father’s Day also reminds me of the very serious calling to live into fatherhood as exemplified in the scriptures. I’m indebted to many “fathers” in my life. Many have served as father figures to me in many different ways. So now, I strive to be a good father to my own kids and a father figure to many of the fatherless in my community. I’m challenged more and more each day by what that actually means. There are many questions about the appropriate ways that churches can and should support the state. There are many arguments for and against the support of the government’s agenda (whether coming from the left or from the right) by the church. But when the vision of the government and the vision of scripture align, then we can wholeheartedly agree to support the good efforts of the government. One of the key efforts of the White House Office of Faith-Based Initiatives is to support responsible fatherhood. That sounds like some thing I can get behind, no matter what my political leanings.